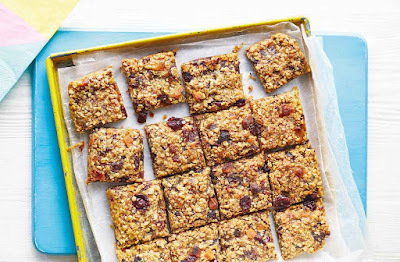 For a teatime treat these chewy flapjacks have been given an extra fruity twist with grated pear, dried apricots and cranberries. fan 160°C. Blitz the dates in a food processor until finely chopped and clumping together. Put the low-fat spread, honey, orange zest and the dates in a pan; heat gently until melted and smooth. Stir in the grated pear, then take off the heat. the apricots and half the cranberries, then stir in the date and honey mix; combine well. Line a 21cm square baking tin with nonstick baking paper. Press the oat mixture into the tin, sprinkle over the remaining cranberries and bake for 40-45 mins until golden. Cut into 16 squares while still warm, then leave to cool. Store for up to a week in an airtight container, or freeze for up to 3 months.